What does a SCUBA diving suit company have in common with a cellphone? Not much unless the company is Body Glove. Founding in the early 1950’s, Body Glove manufactured and designed dive suits. In 1995, Body Glove started using the same neoprene material that made their wetsuits successful to make cell phone cases. Their latest is the Body Glove Silicone Protective Case ($24.95). I put the case to the test with my Samsung BlackJack II. Read on to see if it represented Body Glove well. Out of the box, the Body Glove Silicone case feels much like any other silicone skin. The black rubbery material is a little tacky to add a little “grip” to the phone. 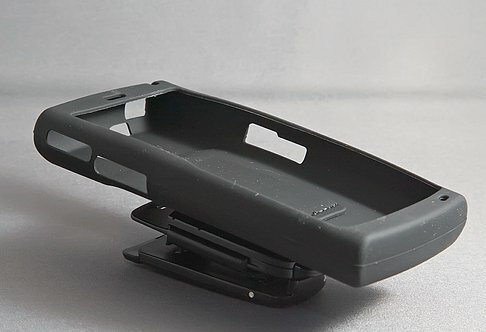 A plastic peg is incorporated into the back of the case to accommodate the swivel belt clip. The case slips onto the phone with ease. The case doesn’t have a center strap which is a little concerning. The phone seems to fit securely in the case but I think a center strap running horizontally across the phone (much like the Mobi Skin Case ($14.95) would increase the security of fit for this case. While it did not happen while I reviewed this case, I kept having the fear that the phone would pop out of the skin. The Body Glove is form fitted well and the outer tackiness is present on the inside of the case so my fears may be unwarranted. The silicone offers a good amount of protection from bumps and nicks to the corners and back but the front of the phone is exposed. The front is also exposed when you carry this case on your belt. 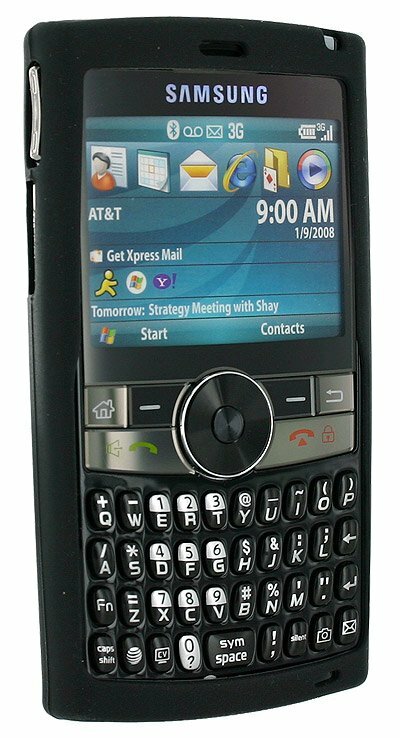 It does add noticeable thickness to thin phones such as the BlackJack II but I don’t think it would be as noticeable to the larger phones such as the Treo 750. The skin has cut-out sections to allow access to the volume key, mini-SD port, charging/sync port, and camera. The belt clip swivels to accommodate horizontal carry and the rotation is firm. 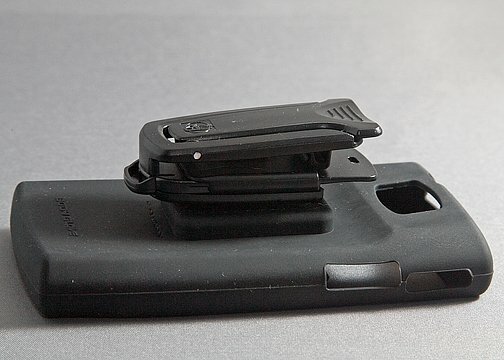 The clip snaps securely to the peg on the back of the case and unfolds to become a stand for the phone. This is ideal for when you want to watch videos or use a external keyboard to do some serious text messaging with. The case road well on the belt but I couldn’t help but feel uncomfortable carrying the case with the keyboard and screen exposed. The permanent peg for the belt clip makes pocket carry a little uncomfortable. If the peg could be unscrewed for pocket carry, comfort levels would increase dramatically. I’ve used Body Glove cases from time to time over the years and have always felt they made quality cases. The Body Glove Silicone Protective Case ($24.95) is a quality case. If you are looking for a skinned case that can be worn on the belt, the Body Glove Silicone Case is worth consideration. I’m a little concerned about how securely the phone fits into the case and the fact that it rides face outwards. 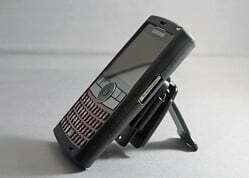 However, it is well built, rides comfortably and offers a moderate level of protection for the phone.